Residential sector rebounding due to monetary policy and trade agreements signed recently. 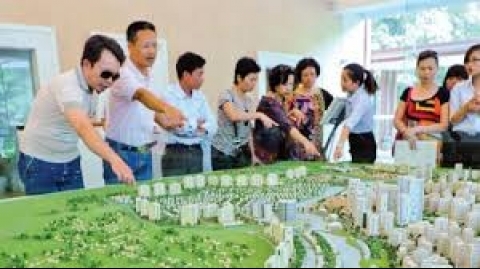 2016 is expected to be a promising year for Vietnam’s real estate market as it enters a solid recovery phase following improved macro-economic conditions, Savills wrote in their latest report, released on March 25. Almost all asset classes have rebounded, most notably the residential sector, due to revised monetary policy and expectations over foreign trade agreements the country signed last year. In the Savills Property Price Index (SPPI) report released in January it wrote that the market has recovered over recent quarters with more projects being launched and large volumes of transactions being recorded. The overall absorption rate in the residential sector in Hanoi was 40 per cent, falling 5 percentage points (ppts) quarter-on-quarter but increasing just under 2 ppts year-on-year. Some 6,440 units were sold in the first quarter of the year, a slight decline of 3 per cent quarter-on-quarter but a sharp increase of 86 per cent year-on-year due to increasing buyer confidence. Rapid urbanization, a fall in household occupancy, and a young population will continue to underwrite residential property demand in Vietnam in 2016, Savills analysts believe. “In the short-term, economic fluctuations represent the main risk, but the growing middle-class demand for new homes represents a long-term trend,” the report stated. Prominent projects in Hanoi include Watermark Apartment Hanoi on Lac Long Quan Street, west of West Lake, and the Green Pearl complex on Minh Khai Street . Meanwhile, in the central region numerous resorts and residential real estate projects have cropped up. Ocean Apartments was built within the Da Nang Beach Resort complex on Son Tra Dien Ngoc Street and Naman Residence was built on Truong Sa Road in Da Nang. Laguana Lang Co in Thua Thien Hue province is the largest integrated luxury beach resort in the region.